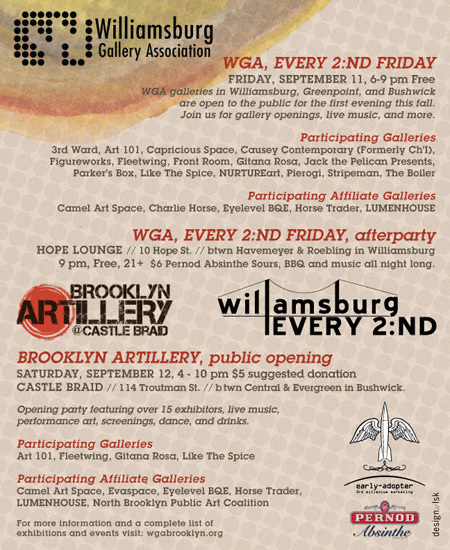 THIS WEEKEND: Brooklyn Artillery & More! 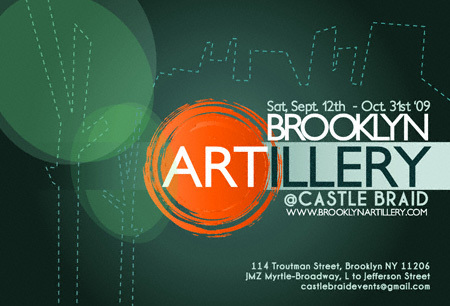 Please join me this weekend at the BROOKLYN ARTILLERY ART FAIR at Castle Braid in Bushwick, Brooklyn. I will be in a two-person show with Sara Hubbs for Lumenhouse. The Opening Reception is this Saturday, September 12 starting at 4PM and going until midnight.Â Paid admission is optional. I will be there on Saturday from 4 – 10 PM and I will also be sitting for the gallery 12 – 6 PM on Sunday. The art fair continues the following weekend (19 & 20) also. Starting September 12 at 4:00 p.m. It should also be noted that this event will be held in partnership with the Williamsburg Gallery Association which will be conducting the latest of their 2:ND Friday series tonight! For more information about what the WGA has cooked up for our delectation this dreary Friday click here. One Comment on THIS WEEKEND: Brooklyn Artillery & More! I went to the Brooklyn Artiillary thing not knowing that it was hosted by a developer trying to rent out apts in his gross glass and steel building on Troutman Street…nothing against the artists but showing art in a building hyping the fact that you never have to interact with the community because you have your own grocery store, gym, recording studios, wii, etc…ewwww…..anyway going inside confirmed all my hatred of these structures. ANd my discomfort with the people who find them attractive. Artists really need to be careful about things like this…but I suppose this is our new society..